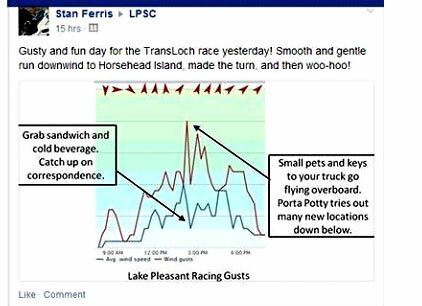 Stan Ferris offers this interpretation of the Saturday wind gusts. From 20kts+ to 0 to 20kts+ all with in 5 minutes, Lake Pleasant served up a great final weekend of racing. Congratulations to the Spring Series Winners: Steve Grothe, C22; Greg Atwell, Multi-Hull; Victor Felice, PHRF Non-Spin; Norm Anderson (by one point over Tom Baker! ), PHRF Spin; Martin Lorch, Santana 20; Chris Smith (by two over Mike Ferring), PHRF Sportboat; Jason Rziha, Thistle; Steve Dolter, TransLoch. And the Combined Fall-Spring Winners: Steve Grothe, C22; Brian Willess, Multi-Hull; Victor Felice, PHRF Non-Spin; Norm Anderson, PHRF Spin; Martin Lorch, Santana 20; Chris Smith, PHRF Sportboat; Jason Rziha, Thistle. All but Multi-Hull will represent their fleets in the Club Championship Regatta in May.